The B&W Fold-on case is crafted with a moulded strike-proof ABS plastic exterior that withstands heavy bumping and jolts during travel. 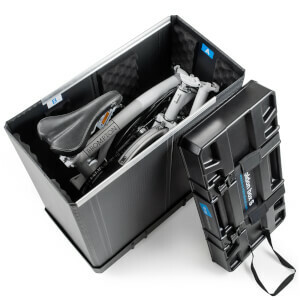 A handy extendable telescopic handle and two rolling wheels to the bottom of the case make it extremely easy to transport, and a foam padded interior keeps your bike completely safe from the moment you leave you home until the moment you're abroad and ready to put your bike to use. - L.R. I have traveled with my bike for years now and this case has been wonderful. I can pack a few light things in with it and check it through as regular luggage on the plane. I am able to get to hotels using public transit as it is very maneuverable. About 3 years ago I arrived at my home airport to find my case busted. It looked like an elephant had stepped on it with a big hole on top and the locks busted. But, it did its job and my bike was not scratched. The airline didn't ask a single question, they just sent me a check to replace it, which I did with a new one that has been working fine. 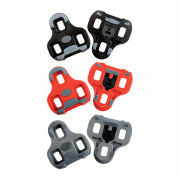 The only thing I would recommend to the manufacturer is to beef up the latches. Sometimes I find them open when I pick it up, but thanks to the velcro straps the case is still closed. Bike fitted in perfectly, there is space for other items but obviously would increase the weight. 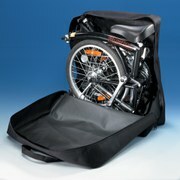 With just the bike, it comes in under the 20kgs for standard luggage allowance. Booked mine in as standard luggage with no problems at all, arrived and returned in perfect condition, no scuffs to the case etc. Won't take a 2017 S6R Brompton with an extended seatpost unless the seat is removed. Will take one with standard post (easily) or telescopic post (barely). Otherwise fits the S6R with miles to spare. No need to remove pedals or any other bits. L or E models might not have an issue with the extended seatpost but cannot test this. External carry handle protrudes outside the lines of the case. Seems strong but will get hit in transit. Needs to be spring loaded and recessed, which if done correctly would allow slight increase in case height and eliminate the seatpost length issue across the board. Telescopic handle is a bit weak. Hi. I bought this travel case for my vacation. I traveled from Calgary Canada to Seoul South Korea. When I picked it up, my brompton bike was still in there very safely and securely. This case is very sturdy and strong. This case saved my bike lol!! Oh and delivery was so fast!! This case looks great but I have not used it yet. I like that it was additional velcro straps to ensure that the case remains closed in case the locks fails. It comes with two keys to lock/unlock the case. I'm not sure if TSA can open these locks if they are locked though. Makes me nervous putting it through security unlocked but probably just me. Case is made in China and the quality is really good. I thought there would be more padding inside so we'll see how it protects my Brompton after several trips this coming year. I think I'll add more padding on my own just to be safe. I've seen this case for almost twice the price so this company did great! If you are not in a hurry and have about 3 weeks to wait for it, get it. Shipping was slow from Amsterdam to California USA. Thank you for the great service! Perfect fit for a Brompton. Has seen 15 airline flights, no overage fees. Holding up well. 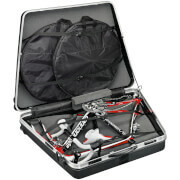 Have used this case for transporting my standard Brompton cycle when staying abroad for a while for work. The previous review is correct that the case is tight for the bike so I do need to remove the seat stem but otherwise fits perfectly. There is space around the bike to add cycle gear but can't get the pannier bag I bought with the bike so may buy something smaller that does for next time. Total weight has been fine for BA. No problems, smooth ordering, delivery and notifications of progress.